WAKADO: Will This Be The Way We See O.J. Simpson Get Life Behind Bars ? / Did O.J. Try To Pull An Armed Robbery In Vegas ? Will This Be The Way We See O.J. Simpson Get Life Behind Bars ? / Did O.J. Try To Pull An Armed Robbery In Vegas ? Sources say OJ Simpson and five other men barged into a hotel room last night, and took various memorabilia once owned by Simpson -- at gunpoint! t happened at the Palace Station Hotel last night at around 7:15. Alfred Beardsley, a memorabilia dealer, had secured various items once owned by Simpson. Beardsley has said he had the suit OJ wore the day he was acquitted of murder. O.J. SIMPSON was being questioned by police on Friday in connection with a break-in at a casino hotel room involving sports memorabilia. The fallen sports star and actor says he went into the hotel room only to retrieve memorabilia that he felt was stolen from him, but police are investigating it as an armed robbery and say Simpson is a suspect. Sept. 14, 2007 - O. J. Simpson told a reporter he was on a “sting operation” to take back sports memorabilia stolen from him. But the Las Vegas police say Simpson is a suspect in an armed-robbery investigation—and they expect late Friday or Saturday to question the former Hall of Famer and acquitted murderer of his wife Nicole Brown Simpson and waiter Ron Goldman. Police arrested former football star O.J. Simpson at a Las Vegas hotel Sunday after police say he and five men robbed two sports memorabilia dealers at gunpoint in their hotel room. 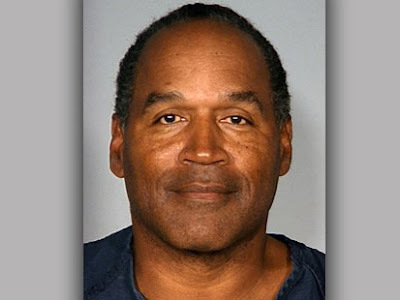 Simpson is being held at the Clark County Detention Center without bail until Thursday, but ABC News has learned that Simpson's attorney plans to file an emergency motion requesting an emergency bail hearing by 10 a.m.
LAS VEGAS, Sept 17 (Reuters) - Former football star O.J. Simpson was held without bail on Monday, accused of stealing back his own sports souvenirs in what was reported to be an expletive-laced face-off with memorabilia dealers. Simpson, 60, who was acquitted in 1995 of the murder of his ex-wife and her friend, was arrested, taken away in handcuff and held without bail on Sunday on suspicion of armed robbery, assault with a deadly weapon, conspiracy and burglary, Las Vegas police said. If convicted on all charges, Simpson could face some three decades behind bars. Welcome to the Clark County Courts in Las Vegas, Nevada.